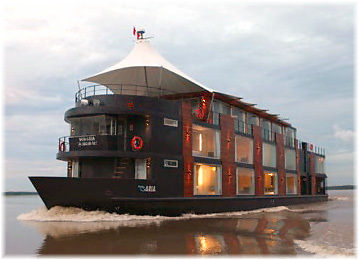 The award-winning travel company Adventure Life is pleased to announce a series of Amazon cruises aboard M/V Aria, only the second luxury cruise ship to explore the northern Amazon River in Peru. The 147-foot luxury vessel was custom built by Peruvian architect Jordi Puig and completed in early 2011 to offer an extraordinary level of comfort and indulgence. Adventure life is offering 4, 5 and 8 day trips from May - December with prices starting at $2,550. For more information or to read Adventure Life reviews, visit www.adventure-life.com or call 800-344-6118. "The M/V Aria offers one of the most intimate Amazon experiences available," said Adventure Life Operations Director Jonathan Brunger. "With a maximum of 32 guests plus crew, this ship provides extremely high-end dining and sleeping accommodations, and phenomenal access to Amazonian wildlife." The M/V Aria offers a relaxed lounge, outdoor Jacuzzi, fitness center, gourmet cuisine and modern navigation technologies. The ship's 16 luxury suites each measure 240 square feet and feature sitting areas and large picture-windows with panoramic Amazon River views. Renowned Peruvian chef Pedro Miguel Schiaffino has created an exclusive menu consisting of fresh Peruvian that promises to be a Peruvian culinary feast for the senses, paired with premium South American wines. Adventure Life cruises aboard M/V Aria include guided jungle explorations; encounters with bald uakari monkeys, squirrel monkeys, saddleback tamarin monkeys, sloths and many other species; opportunities to photograph rare gray and pink freshwater dolphins; a visit into Pacaya-Samiria Reserve; encounters with locals in the native village of Puerto Miguel; and skiff excursions into the bowels of the Amazon forests. Here is a link to the full itinerary - www.adventure-life.com/cruises/ships/mv-aria-220/luxury-amazon-2277 or call 800-344-6118.